Introduce your students to the wonders of astronomy with our digital Skylab. 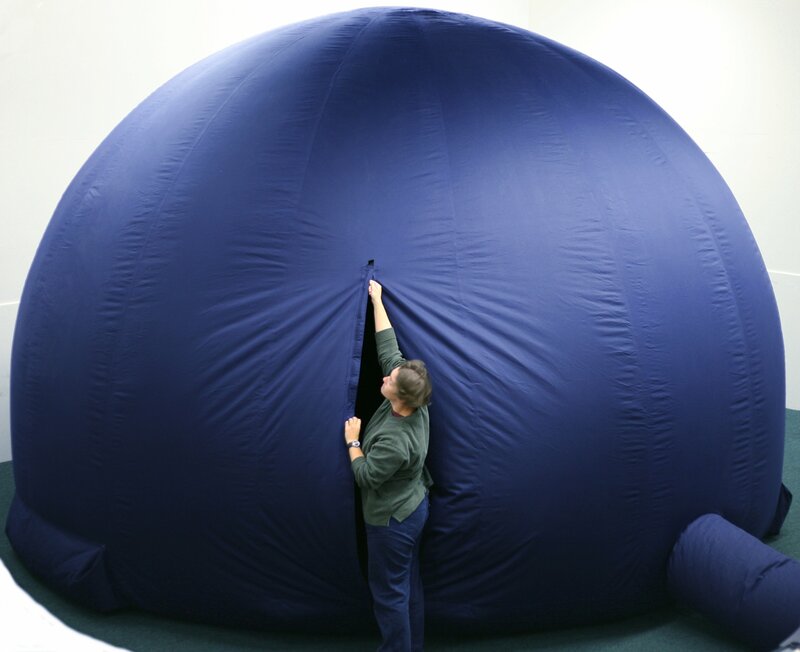 Skylab is a portable planetarium providing science programs coordinated to class studies and presented by a professional astronomy educator. The museum has replaced the old Starlab equipment with a new digital system that is on par with the quality of the new planetarium equipment; it is amazing! Up to 24 students at a time can enter the Skylab and learn astronomy via prerecorded shows or live interactive presentations. They can view the night sky, journey to planets, learn star mythology, explore black holes, meet ancient astronomers, and even pilot their own “spaceship” through the Universe. 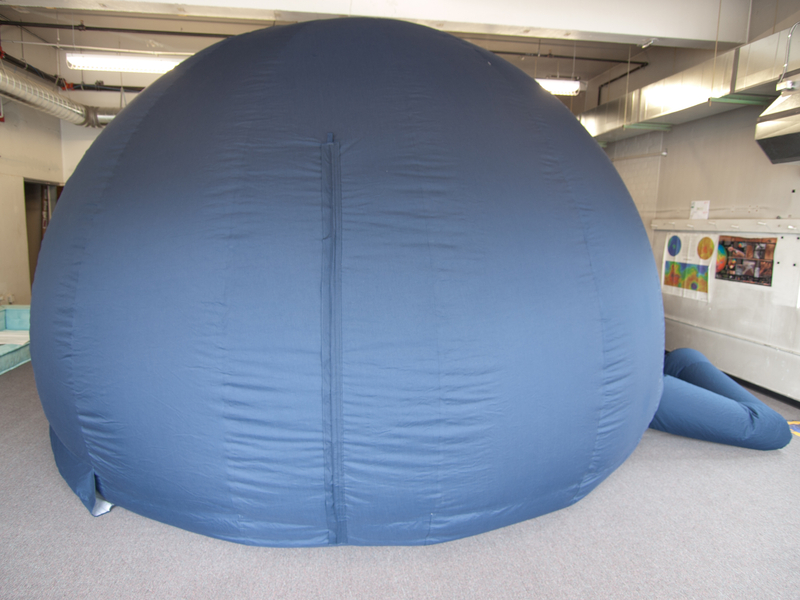 An inflatable astronomy laboratory for your school, the dome is 10.5 feet tall and requires floor space of 25 x 25 feet. It can be set up in a gym, lunchroom, empty room, or on a stage. Click here for descriptions of the shows. Scroll down until you find the show title you are looking for. The Uniview Experience is a digital database that provides an opportunity for your students to “fly” the projector “spaceship,” with the touch of a button, through the solar system, the galaxy, and the Universe. We can also provide classroom activities to supplement your show. This flexible and valuable teaching tool is available for $215 for one hour. (One, two, or three presentations can fit in an hour, depending on the presentation selected). Each additional hour costs $70. Your booking will include a qualified presenter and delivery of the Skylab. If the destination is outside of a 25 mile radius from the Peoria Riverfront Museum, the standard IRS mileage rate will also be charged, round trip, plus a travel fee of $15 per hour. For more information or to reserve Skylab, contact Nick Rae at nrae@peoriariverfrontmuseum.org or 309-863-3025. Bringing the Stars Closer to You! An astronomy expert will give your group a tour of the current night sky using our 8-inch reflecting telescope. We will show your group the Moon (if visible), current planets, and deep-sky objects (galaxies, star clusters, and nebulae) with the telescope. Using a green laser, we will also point out constellations in the real sky, and share a star story or two! Program is subject to weather conditions. Payment is due upon arrival. Cost: $150 per hour of programming. If the destination is outside of a 25 mile radius from the Peoria Riverfront Museum, the standard IRS mileage rate will apply. Scheduling: Contact Renae Kerrigan at 309-863-3030 or rkerrigan@peoriariverfrontmuseum.org. A few objects you might be able to see, from left to right: Andromeda Galaxy, Jupiter and 4 Moons, Orion Nebula, Ring Nebula. Tell us what space topic you’d like us to present on, and one of our astronomy experts will be there with pictures, videos, and answers to people’s questions. You might be interested in a presentation on the Apollo moon landings, for example; or maybe on lunar and solar eclipses; but really, any space topic you’re interested in is something we’d likely provide a stellar presentation on: just ask!